Do you know what this symbol means? You probably know it’s a symbol that’s got something to do with magic. But what exactly…? This is the Wiccan symbol for the Triple Goddess. And it’s not necessarily a heathen or magic symbol…I see it as a beautiful symbol for the circle of life and how each phase of life is equally important and sacred. The Tripple Goddess is symbolized as three phases of the moon and bears a ritual relation to the Christian holy trinity of the father, the son and the holy ghost. But…there is a difference. 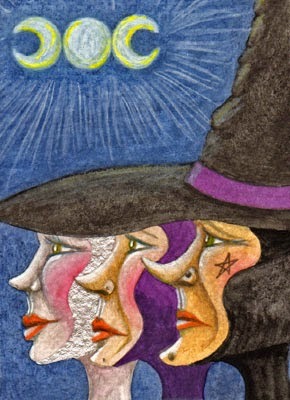 In paganism the Triple Goddess does not refer to a deity, but to the sacredness of each phase of a woman’s life and therefore to the sacredness within each of us. It’s the innocence and purity of the virgin, the care and nurturing of a mother and the experience, wisdom and care in the crone, the old and wise woman who takes care of the world around her. the world. She’s got so much experience and wisdom to share. So much beauty. We live in a world where marketing aims at young people specifically. We hold little sacred in our world anymore. The only thing that seems really sacred is beauty and outer appearance. As if beauty in itself has become sacred. Our notion of sacred beauty equals youth…extreme youth. Models are flat chested, very thin and almost androgynously built, thereby symbolizing the not yet awoken femininity…narrowing down beauty to the purity of an innocent and unwritten child. indescribable beauty to be discovered. Our society is forgetting how important the mother and the crone really are. In real life and in symbols. It’s the nurturing spirit of us people that builds a stable society. It’s the wisdom of experience that helps prevent mistakes from the past to happen again. It’s the experienced hand that soothes the sorrow. The one who lived through pain that can offer genuine support to those who have yet to learn. For she who’s lived through it, can help carry the pain. And she who’s seen all the seasons pass, those of the world and of her own life, knows the bigger picture. She can lend a listening ear and offer sound advice. 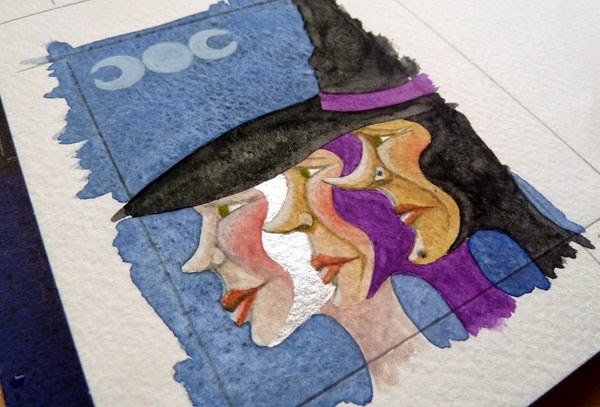 The Tripple Goddess ATC, gouache and white pencil on heavy Fabriano watercolour paper. 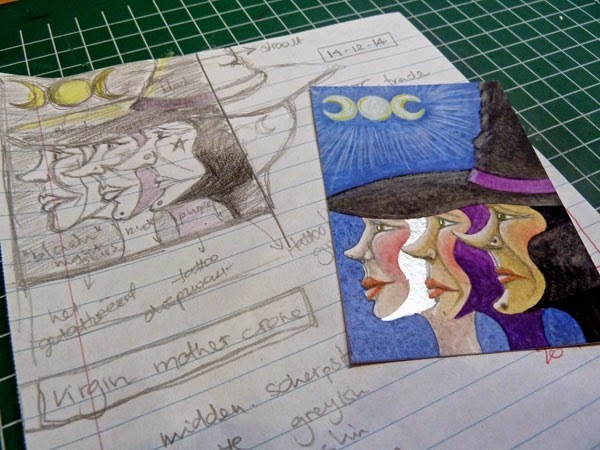 For an ATC swap I drew the Triple Goddess, honouring the beauty of the symbol (which I don’t find wiccan necessarily…why not adopt the symbol anyway?) and thereby honouring the beauty and sacredness of every phase of womanhood. 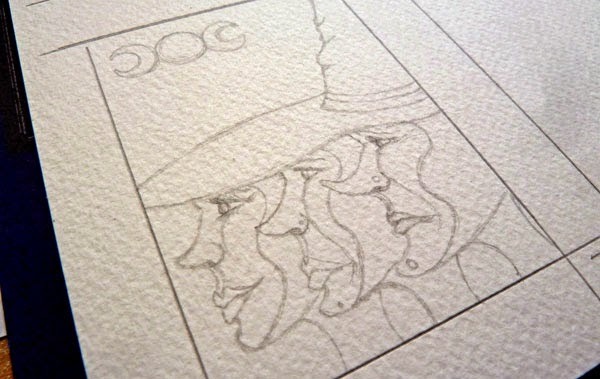 The tattooed pentagram on the crone’s cheek is another beautiful symbol. It’s very commonly connected to modern whichcraft. But in reality the symbol has been adopted and used by many more groups of people. In the most earthly sense it is a representation of man in his universe. A little deeper it stands for the universe…the 5 elements of which the universe is built, namely earth, air, fire, water and spirit (life). And on a spiritual level it stands for the five senses through which we perceive the universe that we are given plus the sixth sense that is the entirety of the 5 senses together, our intuition, or our soul.